Super Bowl Sunday is here. The Super Bowl 2012 broadcast on NBC will start at 2pm ET with the pre-game coverage. The SuperBowl will start at 6:30pm ET. There will be already very cool ads during the pre-game show including several hot movie trailers. 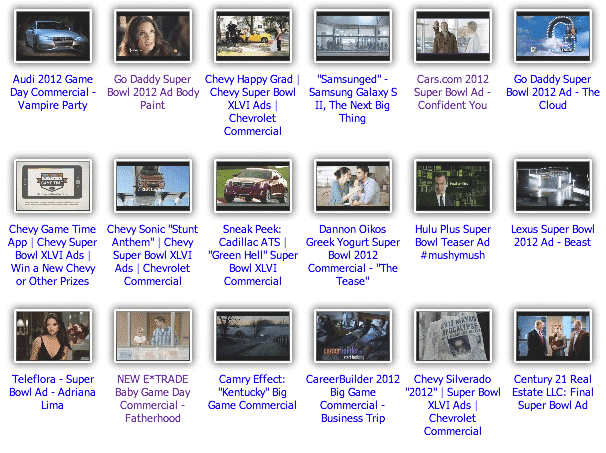 Super Bowl Advertisers have already published about two thirds of all Super Bowl 2012 ads ahead of the Big Game. We will add the unreleased Super Bowl ads as soon as the air during the Super Bowl broadcast to our Super Bowl Ads Online Video Gallery.